Give a creature -4/-0 this turn. Calm is a common Willpower action card. It is part of the Core Set. In addition to the card's availability in the Core Set, two copies are included in the Ancano's Cunning theme deck. 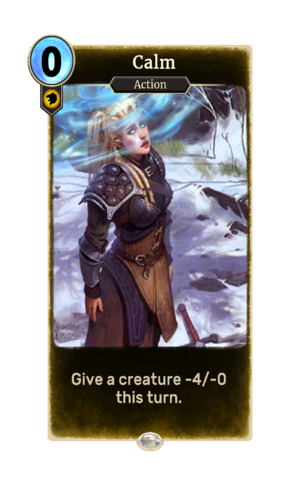 This card's ability applies the Calmed card effect. The Calm spell has appeared in Morrowind, Oblivion, and Skyrim Skyrim. Playing this card counts towards the Illusions Cast statistic.